Steel bars fulfill a large number of uses. Because of its intrinsic strength, which stems from its circular cross section. 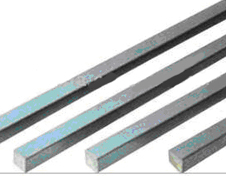 Square bars are used in general engineering and automative products. Bars come into varieties, both having identical measurements. Dia(mm) x Dia(mm) x 0.0024 = Weight/Foot.